We started our journey up to Horseshoe valley to try out the trails there. 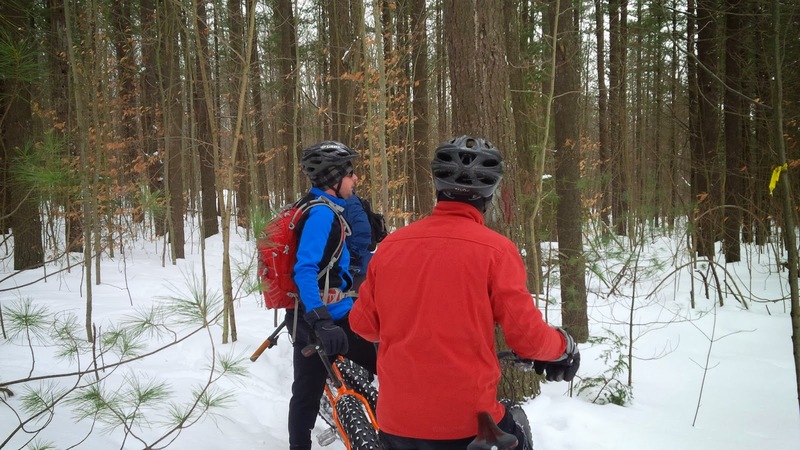 When we arrived at Horseshoe we were told that we could only ride on the snowshoe trails as the cross country trails would be too soft for fat bikes. So we paid our 16$ and headed out…. 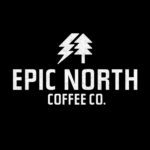 we tried the first part of snowshoe trail, and there only had been 1 person on them… so that wasn’t going to happen… we popped back in and they told us to try the trails on the other side of the road where Copeland Forest is. so we headed over there, and again, not going to happen. They were very nice, refunded our money and we then headed over to Midhurst (School Board Trails) off of Hwy 26. We did have a slight delay on the drive over to Midhurst, as Mike took Hwy 400 south where the rest of us stayed west on Horseshoe valley road. Once mike turned around and made a few more wrong turns out convoy could continue. 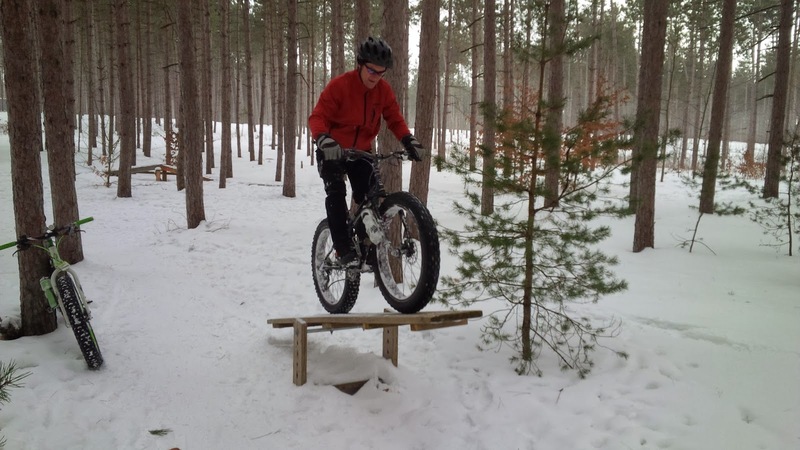 Lucky for us Don is a guru guide at the Midhurst trails, and they were in excellent shape! With a lot of hiker, snowshoer, biker and xc skier traffic, the trails were packed down really nicely and allowed us to ride single track again. 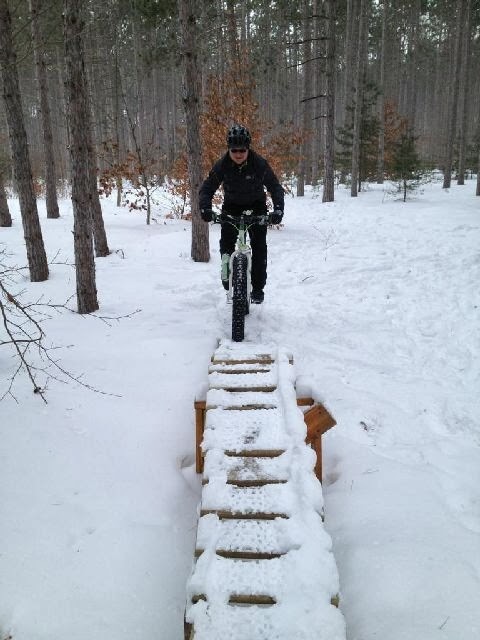 Which was a great change from riding xc ski trails or snowmobile trails. 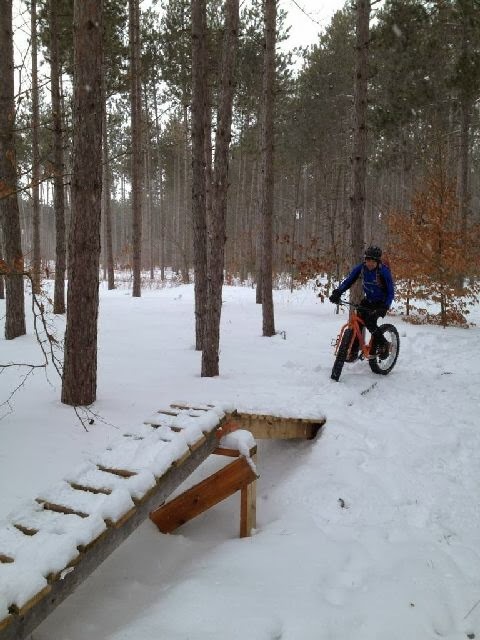 The nice part of the Midhurst trails is that there is no real nasty hills, and there is the odd feature to play on. All in all we had a great day of riding, and invite anyone to join us! The more the merrier on the trails.